Today I signed up for Spotify and to be honest, I instantly regretted it. I only signed up for the app because there was internet sensation surrounding the release in Australia and after seeing Twitter hashtags like #spotifyisorgasmic, I had to know what the deal was. So I signed up in that typical Gen Y, non-committal internet way. I skipped through the 94832 pages of terms and conditions, downloaded the application to my desktop and out of sheer laziness, linked my Spotify with my Facebook account, instead of creating a new account. First mistake. Before I tell you the devastation that followed, let me say that I do not like this superiority Facebook has with the internet world. Facebook knows more about me than I know myself and that’s because Mark Zuckerberg has managed to integrate every single app on the planet of the Earth into Facebook’s interface. I can already tell that when I die, all of my information will just be taken from Facebook because it’s essentially my life pre-packaged in a nice CSS layout. Facebook knows which friends I obsessively stalk and I know this because every time I go to de-activate my account, it always says, “(insert close friend here) will miss you” and then I feel I have to stay on Facebook because the de-activation of my account would leave a gaping hole in my friends’ lives. And we really can’t have that, can we? Way to guilt trip me, Facebook. But it doesn’t stop there, Facebook also knows I read trashy trending articles about Snooki’s pregnancy and why Lindsay Lohan is back in jail and then shows my activity to the world so people can judge me. And now, having linked my Spotify with Facebook, it knows which music I listen to and true to form, Facebook intends to share it with everyone. Second mistake. Headphones plugged in, I started surfing the playlists Spotify recommended based on my iTunes library. After a while of switching between tabs, I realised the song I was listening to was posted on my timeline for everyone to see. No big deal right? Until I realised what the song was. Third mistake. Oh god. Embarrassing. 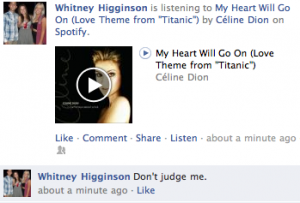 While all of my friends are going through the dub step phase of ‘dropping the base’ here I was, listening to Celine Dion. And not just any song of hers either, it had to be a song which basically told my friends, “I am an emotional wreck. Handle me with caution because I am sitting here listening to ‘My Heart Will Go On’ and wallowing in self-pity. Judge me. Judge me all you like.” And come on Facebook, that wasn’t the case at all! I tried to fumble with the settings on Spotify, so my embarrassment would be saved but alas, I was too late. Fourth mistake. Let me just clarify that I do not know how this happened. 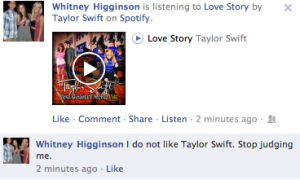 I do not like Taylor Swift. I have never liked Taylor Swift. She has never had a home in my iTunes library but Spotify somehow thought we would be a perfect match. Well, after the abundance of relationships she’s had (and break-up songs that followed), I’m starting to think she has no match in this world. Sad but true. I’m sure she’ll write another album about it, so don’t feel too sorry for her. I quickly skipped the song. Finally, Spotify had found a match that I wasn’t ashamed to show my Facebook friends, but I’m sure they were judging me nonetheless. Nickelback. I know no one else in the world bar me loves Nickelback but I was still enjoying the song, so it didn’t matter. 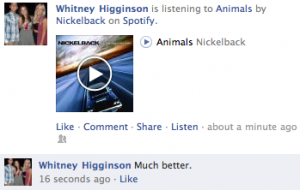 After it finished, reality hit me: nobody wants to be friends with someone who publicly listens to Nickelback. I mean, I have had their discography playing on my iPod for the past two weeks but I didn’t care because nobody actually knew! So in an attempt to retain my internet popularity, I quickly deleted Spotify.